Hamissou Rhissa is a Masters student in Sociology and Anthropology from Abdou Moumouni University in Niamey, Niger. He is also a member of OCSDNet’s Projet SOHA (Open Science in Haiti and French-speaking Africa), through which he is currently initiating a project that seeks to develop a science shop at his university, while advocating for open science and open access. 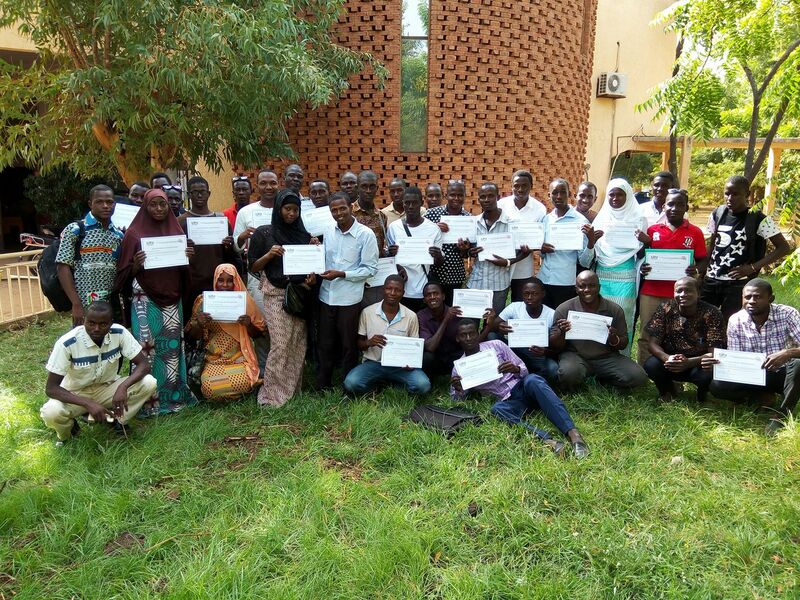 In the blog below, Hamissou writes about his experience organising an OpenCon Satellite event in Niger during International Open Access Week 2016. Hamissou feels that researchers and scientists have important social responsibilities, including a role to play in local development. We launched OpenCon 2016 Niamey four days before the end of International Open Access Week, inspired by a similar event that members of the SOHA Project were organizing in Cameroon. As a young researcher and member of the SOHA project in Niger, I decided to host a satellite open access week event in Niamey. Florence Piron, a professor at Laval University and researcher within the SOHA Project, approached me to ask if we would be doing something here in Niger for International Open Access week. Then, Thomas Hervé Mboa Nkoudou, another member of the SOHA Project put me in contact with Lorraine Chuen from the OpenCon team, who agreed (despite the very short notice!) to set up a website for me. The SOHA Project offered me financial support to cover material organization, internet connection, prints, food and refreshment for participants at the event. This was the first step. The next step was to publicize the event through social networks, SMS and announcements. I also wrote invitations to some professors at the faculty of art and humanities, including the Head of Department and the Director of popular university of Niamey to attend the workshop. Many people in Niger do not have email addresses (as this requires covering the high cost of internet access), so SMS was very important for advertising the event. In the end, we had a good turnout, with about 60 students attending the event. On the day of the event, we worked with printed presentations because we didn’t have the resources to do an on-screen projected presentation. So, we distributed the presentation to participants. They also received a document designed by the SOHA Project that can guide students to search for open scientific papers through the web. We scheduled two presentations. I facilitated the first topic, which consisted of a short overview of The SOHA Project and the five pillars of open science (Open access to scientific and technical information, open source free software, alternative research space, citizen science and collaborative work). After this, Florence Piron joined the discussion via Skype, to address questions raised about the main objective of The SOHA project and the possibility to link social needs, culture and scientific research. On the one hand, the answer to these questions helped to convince participants that it is possible to change the current scientific research and teaching system to be more linked to social needs, as well as more democratic in nature. On the other hand, it allowed them to reflect on national issues and the possibilities that can arise by taking advantage of opportunities facilitated by open science and open access. The second presentation was done by Florence Piron who specified the different forms of cognitive injustice, as well as outlining some steps to design a national policy framework for open science and the benefits of open access to Southern countries. After these presentations, all participants moved to the faculty restaurant for refreshments and to discuss the national stakes of open access. A paper was distributed to collect each group’s summary of their proposition. All in all, participants were very happy to learn about the SOHA Project and were proud to hear about open access and its issues in the Global South. After the discussion, all participant who registered their name were awarded with a certificate delivered by the SOHA Project. The event closed with a group photo of all participants. This activity was undertaken as a part of the SOHA Project in Niger, which seeks to conduct activities that train students on open science while identifying its suitability in this context. For the first time in Niger, we celebrated International Open Access week in collaboration with the OpenCon team. This provided us with an ideal opportunity to help students in Niger understand the open access movement and its benefits for our country. Participants were also interested in open science and joined the Project SOHA Facebook group (réseau science ouverte en Haïti et en Afrique francophone). Lastly, a roadmap was collectively written in order to move forward in adopting open science at Abdou Moumouni University. For more information about Projet SOHA, check out their website or join the discussion via their Facebook Group. Check out a similar blog by guest blogger Lillian Juma, discussing her OpenCon event in Kenya, 2015.